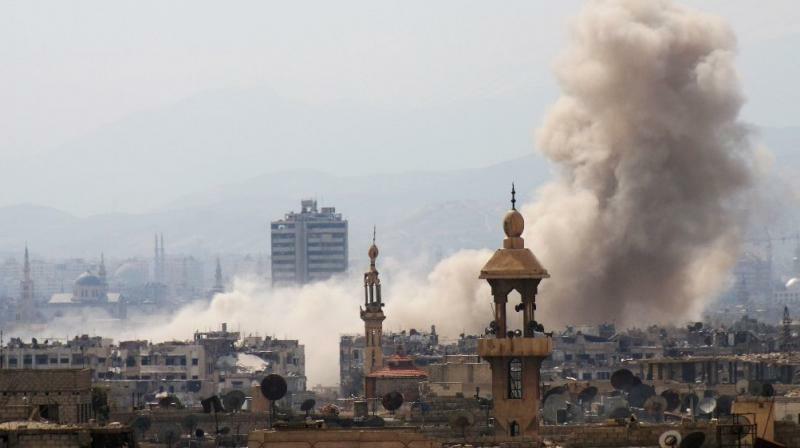 Damascus: Syrian state media reported early Thursday that an aerial attack by the US-led coalition had hit several military positions in the country's east, but said there were no casualties. "Some of our military positions between Albu Kamal and Hmeimeh were hit this morning in an aggression by American coalition warplanes," said a military source quoted on state news agency SANA. The source told SANA the attack only caused "material damage." Albu Kamal and Hmeimeh lie in Syria's eastern Deir Ezzor province, where Russian-backed Syrian troops and the US-led coalition have been waging separate offensives against the Islamic State group. A "de-confliction" line in place since 2017 is meant to keep the two assaults from crashing into each other and runs along the Euphrates River. A military source of forces allied to Syria's government said the strikes had targeted two regime military positions near a frontline with IS. "Daesh then launched an attack on the positions. The strikes and attack left a number of Syrian fighters dead and caused material damage," the source said, using the Arabic acronym for IS. "There are no Iranian or Lebanese fighters among the dead," the source said. IS overran swathes of Syria and neighbouring Iraq in 2014, but separate offensives across both countries have seen its grip on territory shrink dramatically. After a fierce month-long battle, an evacuation deal saw the remaining diehard jihadists bussed out of the city towards small pockets of land still held by IS in Syria's Badiya. The Badiya is the vast desert stretching from the country's centre to its eastern border with Iraq.